The challenging part in bulging eye treatment is to find out the underlying cause. This will determine the overall course of treatment. The most common form the grave’s disease is an autoimmune disease. So the treatment for bulging eye due to thyroid condition should target thyroid hormones and their effects. Ocular oncology deals with tumors relating to eye. The primary requirement in ocular oncology is preservation of life of the patient by removing the tumor, along with effective methods directed at conserving normal vision, followed by cosmetic appearance. A multi-specialty effort is needed for the treatment of ocular tumors, which requires coordination between the ophthalmologist, medical oncologist, radiation specialist, head & neck surgeon / ENT surgeon and paediatrician/internal medicine/hospitalist. A condition of the eye named as proptosis or exophthalmos is characterized by the bulging of the eyes. 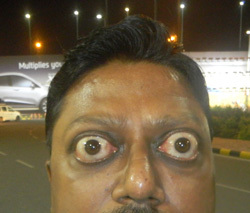 Some people naturally have bulging eyes owing to variations in the anatomy, while others can develop this condition due to various other reasons. Sudden development of a bulging eye needs immediate medical attention. One of the most common causes of bilateral eye bulging is a thyroid condition referred to as graves condition. The thyroid dysfunction along with abnormal changes in the eye causes Graves’ disease or thyroid eye disease. Symptoms usually appear in hyper thyroid patients but can occur when these levels are normal or below normal. In thyroid eye disease, the eyes fail to blink and seem to be staring. In graves thyroid eye disease, eye muscles show swelling, fibrosis and scarring surrounding the eye. Unilateral proptosis/exophthalmos may be an outcome of a sinus infection which causes abscess by spreading into the orbit. Unilateral protrusion of the eyeballs can results from trauma, inflammation, malformations in blood supply to the orbit, orbital tumors and cancer. The pressure inside the eye may increase with the eyes bulging and the high intraocular pressure increases the risk for developing glaucoma. The eyelids fail to close completely during normal blinking or sleeping, causing the cornea to dry out. This dryness can cause scarring along with a nagging discomfort which could eventually lead to permanent vision loss. In severe cases of proptosis, even the movement of the eye may be affected, causing double vision. In a normal eye there would not be any visible white between the top of the iris and the upper eyelid. The presence of white in this area is an indication of abnormal eye bulging. Bulging of a single eye, especially in a child, is a very serious condition and should be assessed without delay. Treatment: No self treatment can be done to correct this problem. The eye disease treatment needs to be done by a health care professional. The challenge of the ophthalmologist is to figure out the underlying cause of this symptom. There are two ways of treating bulging eyes; Surgical and non-surgical. The non-surgical way to treat prominent eyes is by injecting facial filler like restylane around the eye socket to build up a bony socket or orbital rim. Artificial tears or gels can be applied several times in a day to ease the discomfort and prevent the cornea from severely drying out. To keep the eyes moist, patches may also be worn at night. In the case of graves eye disease, bulging of the eye can be reduced by medication only. Mild corneal exposure may be treated with eye drop lubricants (tear supplements) and pressure dressings to cover the eye may be used. For people with severe bulging of the eyes, surgery is sometimes the best solution, which either removes the fatty tissue or reduces decompression. Surgery for cancer: The surgery for cancer treatment is most common in intraocular melanoma. The ophthalmologist would have to remove affected parts of the eye, or even the entire eye during the surgery depending on the severity of the ocular cancer. Small tumors may be destroyed using laser surgery or cryosurgery. In cryosurgery the targeted tissue is frozen with liquid nitrogen and later removed. At times, brachytherapy may be used to place a radioactive disc for internal radiation therapy. Sometimes the only choice in treating intraocular melanoma would be to remove the eye. Surgical removal of the eye may be a requisite to stop the spread of cancer or when it is painful and completely blind. Surgery for retinoblastoma cancer: Surgery is not required for smaller retinoblastoma but is recommended if the size of the tumor is very large. In that case enucleation has to be done to prevent further spreading of the tumors. Surgery for bulging eyes: Surgical rectification of bulging eyes (proptosis) can be done by cutting down the amount of fatty tissue in the orbit, the cavity containing the eye and all of its muscles. Other surgical options for prominent eyes include orbital decompression surgery or orbital rim onlay grafting. In orbital decompression the size of the eye socket is expanded by breaking the walls of the orbit outwards there by providing more space for the eyeball to settle further back so that is doesn’t bulge much. And in orbital rim onlay grafting, onlay grafts are placed surrounding the orbital rim to project the rim more anteriorly in relation to the eyeball. This keeps the eyeball in the original position as opposed to orbital decompression. Since the orbital rim sticks out further, the eyes seems less bulging or prominent. These surgeries are fairly invasive but occasionally have severe complications including vision loss.